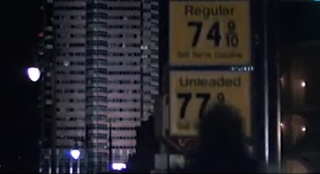 An area with cheap gas to begin with, coupled with a grocery store's 90 cents off per gallon incentive, made the total price $2.119 per gallon. 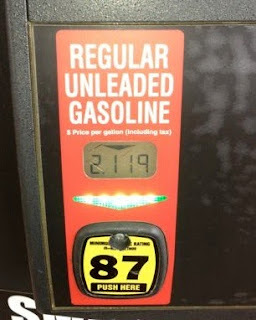 I doubt I will ever see gasoline that cheap again in my lifetime. (46:16 for those who really care.) Those were the days, weren't they? When the gallon dial rolled by faster than the price dial? Alas, even with the eGallon now toted by the DOE and electric car manufacturers, only a few states are lucky enough to have cheap enough power to still be less than $1.00 per gallon (equivalent). For what it's worth, in Salt Lake and other places in the Rockies, their regular is 85 octane gas, rather than the regular elsewhere in the country, which is 87. So while their gas comparatively was still quite inexpensive, to get a true understanding you'd have to tally their second-tier gasoline price with regular gas prices in other places. But, why is that? Does the higher altitude / lower amount of oxygen require a more volatile gasoline, and hence the lower octane rating? And what would happen if you filled up in, say, Cedar City, Utah (altitude 5600 feet) and then drove to Death Valley (altitude -282 feet)? A lot of knocking?